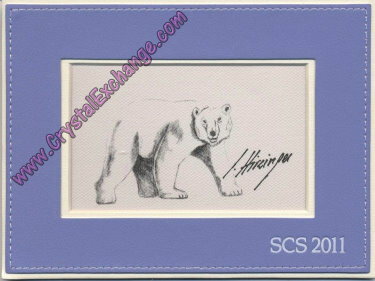 I have learned about another ‘gift with purchase’ item available to Swarovski SCS club members: a Siku Polar Bear print. This polar bear picture is 7.5″ wide x 5.5″ high, including the lavender matte frame. The picture is a hand-drawn polar bear. It features a facsimile signature of Anton Hirzinger, the Swarovski designer credited with the creation of the 2011 SCS Siku. The Swarovski system # for the Siku print is 1271720. Swarovski club members who purchase a Swarovski figurine in early 2011 may receive the SCS Siku print. It is my understanding that some retailers offer the Siku print as a gift with purchase, while others have the SCS Arctic Flower jewelry purse. So, if you are specifically wanting the Siku polar bear print or the SCS Arctic Flower purse, be sure to check with the retailer to ensure that the free gift is the one you want for your collection. For nearly a decade, Swarovski has been hosting instant redemption events at Swarovski stores in February. This year, the dates have been set for the 4th week of February (February 18 – February 25) and it is a big week for Swarovski crystal collectors. During this week, over 160 Swarovski retailers in the USA will host Swarovski SCS retail receptions. There are also unique ‘Swarovski Event’ pieces that are available during this special redemption period. For 2011, the Swarovski Event piece is the Arctic Hare. 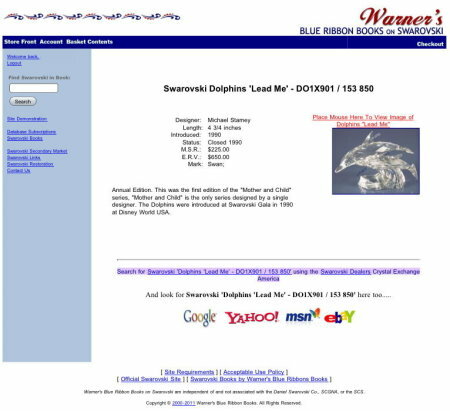 The Swarovski system number of the Arctic Hare is 1055005. The Swarovski Designer is Anton Hirzinger. The approximate price of the crystal figurine is $110. The complete list of participating Swarovski retailers for the February events can be found on the Swarovski web site. Have fun and purchase your Swarovski Siku Polar Bear at your nearby Swarovski store event! Swarovski Puzzle Contest – Up to the Challenge? At the Swarovski web site, there is a Swarovski Puzzle for visitors and SCS members to play. 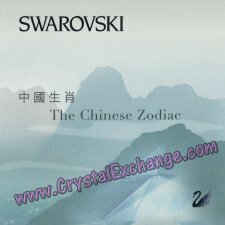 The Swarovski puzzle allows a user to select various images to play the ‘slider game’. I found about 5 different images to select from. The images I was presented were all related to Siku, the polar bear cubs, or the SCS arctic flower products The Swarovski puzzle has varying levels of difficulty: 3×3, 4×4, and 5×5. The higher the level of difficulty, the more time the puzzle player has to complete the challenge. The first step was to install Adobe Shockwave to play. I was anxious to get started! I selected the image for the Swarovski puzzle. I then selected the easy mode. Sadly, I did not have good luck in the small amount of time provided. It’s probably not that difficult, but I found myself ready to give up after a few tries. Guess I need to bookmark the Swarovski puzzle page and try again before the end of the month. The Swarovski crystal puzzle is a cool idea. The Swarovski site indicates that prizes are available for a monthly drawing to users who are able to solve the puzzle within the allotted time. I did not see any indication as to what the prizes are or how many are available. Good luck to all Swarovski fanatics who take the challenge of the Swarovski puzzle! Swarovski has made available to instant redemption Swarovski club members the SCS arctic flower jewelry purse. 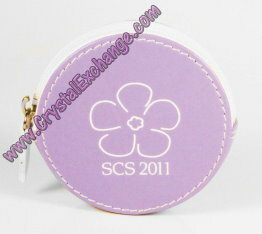 This jewelry purse is lavender in color and features a white arctic flower design along with “SCS 2011″ on the front. The SCS arctic flower purse has a zipper closure and is approximately 2 1/2″ in diameter. Swarovski club members who purchase the Swarovski SCS Siku in early 2011 at an instant redemption event may receive the SCS arctic purse. It is my understanding that supplies are limited and cannot be restocked once gone. I was able to find a listing for this item on eBay for any collectors wanting this item that are not in the official SCS Swarovski club: Swarovski SCS Arctic Flower Jewelry Purse. On December 1, I learned about another online exclusive….the Swarovski Pen and Notebook Set. While it was originally announced on the Swarovski site that the Crystalline Pen and Notebook set would be available online between Christmas and New Years, I did not actually find it there until last week. The description on the Swarovski site states that the ballpoint pen is rose pearl in color with ‘Swarovski’ engraved on the clip and contains 150+ vintage rose crystals in the half of the pen. The notebook is also pink and the dimensions are an A5 format. This Limited Edition Swarovski set retails for $60 on the Swarovski web site. The Swarovski system # of the Limited Edition Crystalline Pen and Notebook is 1097042. Since it is advertised as an ‘online exclusive’, collectors will not find it in authorized Swarovski retailers nor Swarovski boutiques. The only way to purchase this will be directly from the Swarovski web site. It still remains unclear if there is any maximum quantity of production or if it is limited by time (i.e. if there is a final date for purchase). While I think the pen looks pretty, I’m not sure about paying $60 for the set simply because it is a limited edition set. I’m more likely to seek out a similar-colored Swarovski pen….I believe they retail for $20 or $25 depending on the Swarovski store. The arctic air remains upon us (-6 degrees Fahrenheit! ), so it’s time to pull out the camera today for more pictures of SCS figurines. Well this time, when I say SCS figurines, I’m actually referring to “Super Cold Swarovski” figurines. 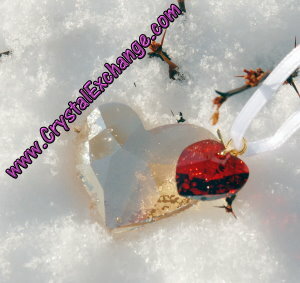 Today, the photography focus was on Swarovski flowers in the arctic snow and ice. Two more Swarovski figurines were selected for today’s photo challenge: the Swarovski Poinsettia and the Swarovski Star Blossoms. 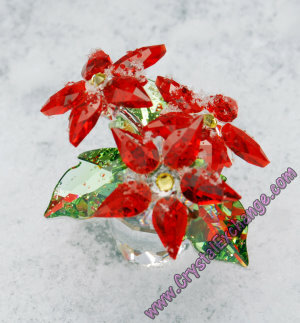 The Swarovski flower Poinsettia glistened in the arctic snow….it’ s amazing that the snowflakes can be seen on the crystal figurine. If you look closely at the image, the frosty snow can be seen resting on the flower petals of the SCS figurine (remember, that’s Super Cold Swarovski). The Swarovski Poinsettia was introduced in 2007 can be found at the Swarovski web site for $95. The Swarovski flower Star Blossoms also had a neat appeal when photographed in the chilly outdoors. The arctic snow surrounding the Swarovski Star Blossoms can be seen in the background. The Swarovski Star Blossoms were introduced in 2009 and are now a part of the retired Swarovski collection. There is still some left inventory of the online store and they are on sale for $55! What a bargain for a Swarovski crystal figurine that once retailed for $90. Hopefully, Swarovski fanatics remaining warm, or better yet in a much more pleasant climate, away from the chilly arctic blast! Perhaps there will be some more pictures of Swarovski flower arctic-style in the snow posted here again! 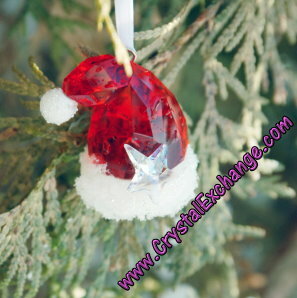 If there are any retired Swarovski flowers on your wish list, check out Crystal Exchange America web site http://www.crystalexchange.com/ ….there’s a good bit listed there. Avid Swarovski crystal collectors may be eager to get their orders in for a new Swarovski Peter Pan Collection. The items in this collection include Swarovski Peter Pan, Swarovski Tinker Bell, and a star-shaped title plaque for this collection. Disney fans may be equally excited to see this new collection collaboration between Swarovski and Disney. While the Peter Pan collection is the newest, Swarovski has produced other collections cooperatively with Disney: Swarovski Lion King, Swarovski Snow White and the Seven Dwarfs, Swarovski Bambi and Friends, Swarovski Winnie the Pooh and Friends, and others. Swarovski also produced Disney limited edition crystal figurines: Swarovski Tinker Bell in 2008, Swarovski Mickey Sorcerer in 2009, Swarovski Pinocchio in 2010, and most recently Swarovski Dumbo in 2011. The Swarovski Peter Pan and Swarovski Tinker Bell feature accents in Olivine (green) crystal, with other colorful effects. The three crystal figurines in the Swarovski Peter Pan collection can be view on the Swarovski site. The site further states that the release dates for the figurines is in early March, 2011. If you are looking for retired Swarovski Disney figurines, Crystal Exchange America has a selection of them. They have figurines dating back to the 2005 introductions and limited edition Swarovski Disney crystal pieces. Continuing the discussion about Swarovski cylinders and boxes, I am going to share more information about the foam inserts used in Swarovski cylinder packaging. 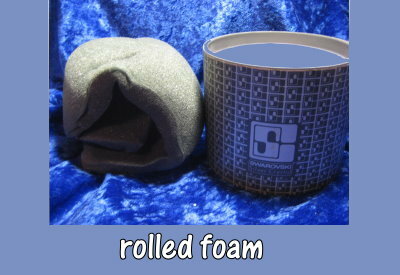 There are three main types of Swarovski foam that I have seen in cylinders. 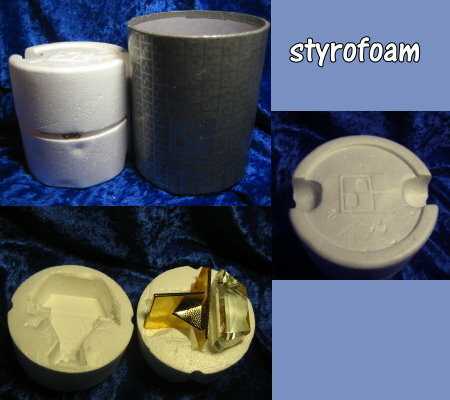 Additionally, I have seen stryrofoam inserts used in Swarovski cylinders. The first type of foam is rolled foam. It is a single piece of foam that a figurine can be wrapped or rolled in prior to placing it in the cylinder. It is generally gray in color and about ½” thick. Being very generic, it can be used for many types of figurines. I have seen rolled foam used in both gray cylinders, but not in blue cylinders. 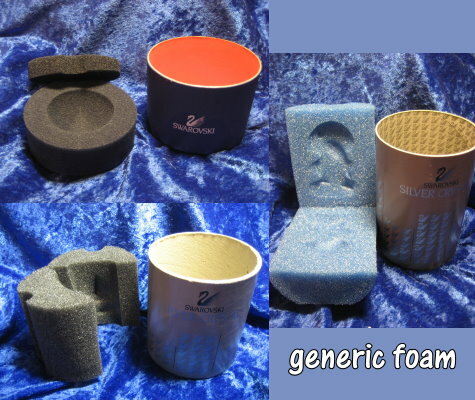 The next type of foam is generic molded foam. It is may be hinged or in two separate pieces. It has a cutout, generic enough for many types of figurines to fit into. The foam is gray or blue in color. The last type of foam is specific foam created for use by one and only one figurine. 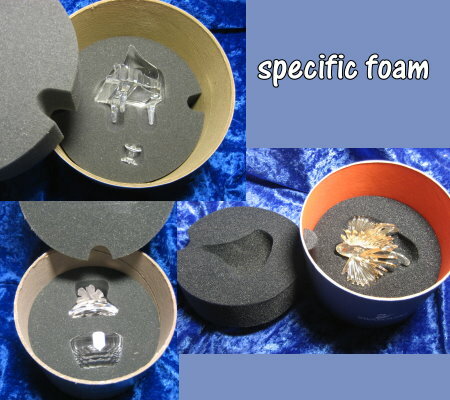 The specific foam was likely created if Swarovski felt that the rolled foam for generic molded foam would not sufficiently protect the Swarovski crystal figurine for shipping and storage. It is gray or blue in color. 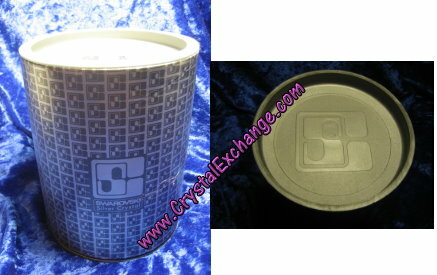 For the very oldest Swarovski cylinders, those with the block SC logo on them, I’ve also seen white styrofoam used. It is in two separate pieces and may also have the block SC logo on it. 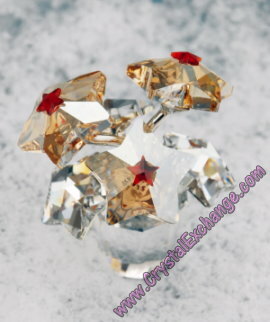 If you have a Swarovski figurine missing the packaging, Crystal Exchange America has a lot of empty Swarovski boxes that include appropriate foam and identification label listed on their site. Swarovski crystal fanatics will be excited about the upcoming release of the new Swarovski Lovlots Circus! Among the new Lovlots Circus crystal figures are: Swarovski Benny Bunny, Swarovski Jade Dancing Horse (Limited Edition 2011), Swarovski Jasmine Dancing Horse, Swarovski Leo Lion, Swarovski Rolly Monkey, Swarovski Rosalie Dancing Horse, Swarovski Toby Elephant, and Swarovski Tony Elephant. Some of the new Swarovski Lovlots circus characters are very vibrant in color. Others circus characters have softer coloring. The Swarovski Lovlots Circus is the 4th series of Lovlots figurines. Other series of Swarovski Lovlots are: Swarovski Gang of Dogs, Swarovski House of Cats, and Swarovski City Park. Another “unofficial series” are the Lovlots Pioneers which are the very first Lovlots figurines. 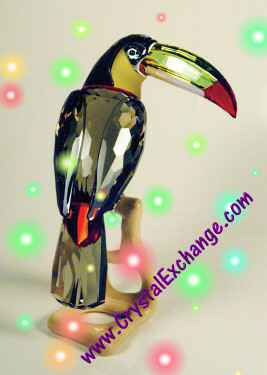 If you are looking for retired Swarovski Lovlots, Crystal Exchange America has a large selection. There are figurines from all four series as well as the special limited edition Lovlots. 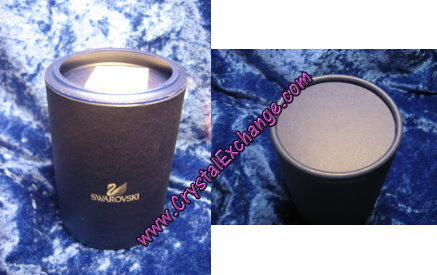 I get many questions about Swarovski boxes and Swarovski cylinders. So here’s a chance for some explanation on the packaging that Swarovski uses to protect the ‘silver crystal’ figurines during shipping and storage at the store prior to purchase. 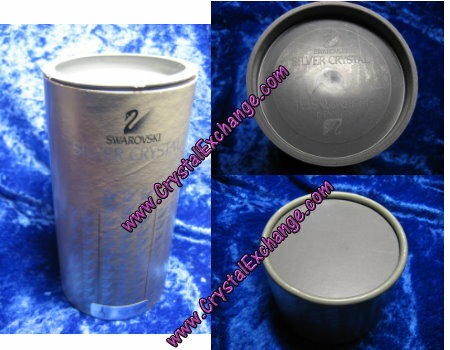 The earliest boxes used are gray cylinders with the old Swarovski logo (block SC logo) printed on them. 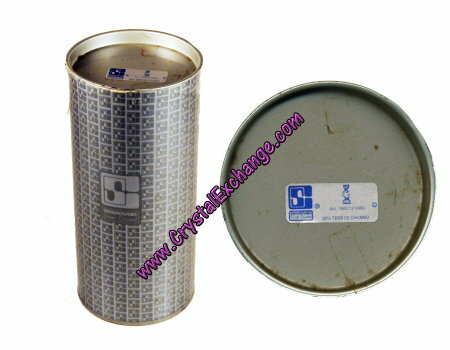 Many of the gray cylinders had two removable plastic ends, so that the crystal figurines could easily be taken out from the top or bottom of the cylinder. (Sometimes the fit was snug with the foam, and it takes more access to pull the figurine out.) Some plastic ends have the block SC stamped into them, and some do not. I have also seen ‘metal ends’ on cylinders, but very rarely. The block SC logo was replaced by the Swan logo in 1989, so the gray cylinders were modified to have the Swan logo printed on them. Initially, these gray cylinders also had two removable plastic ends. Some plastic ends have the Swarovski swan stamped into them, and some do not. Later, one end was modified to a permanent cardboard-like bottom, and access is only available opening the top end of the cylinder. This modification may have been a money-saving opportunity or perhaps a safety concern for the figurine as the plastic ends do not stay snug on the Swarovski cylinders indefinitely. Around 2002, Swarovski changed their corporate colors to navy blue. At this time, the cylinders changed colors again, to navy blue. The navy blue cylinders have the Swarovski swan printed on them and have access via the top only, as only that end is detachable from the cylinder. I do want to mention that when gray cylinders were used, Swarovski crystal logos, certificate style, and box logos did NOT all “match” across the board on the set. This is especially true for figurines produced during that cross-over time when the logo changed. Swarovski did not discard the original boxes, they simply used them until the stock was depleted and then began using the newly designed cylinders. So, a collector should not be alarmed when retired Swarovski is purchased if this is there is not a 100% match on logos for their crystal figurine, certificate, and packaging. Crystal Exchange America has a lot of Swarovski empty boxes listed for sale on their site, if you have a Swarovski figurine that needs protecting.